How good is your dog’s recall? Go on, be honest with yourself. Is it a “puppy” recall, from a sit a pace or two from you within four walls? Is it fine from a sit for the distance of your hall (training or home)? What is it like if there is a distraction? What is it like outdoors? Now for a supplementary question – how big is your garden? If you only have a reliable recall for 10 yards, and your garden is larger than this, then you have a problem. 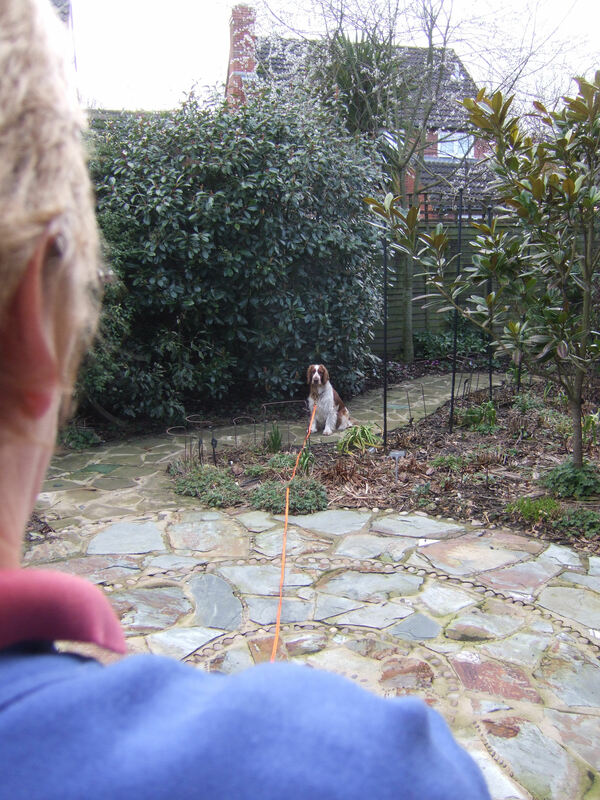 To me, a good recall is one of the most important things to have when you garden with dogs as it means that you can stop your dogs doing things you don’t want them to. You can reward them for coming to you rather than getting cross with them for what they are doing. You need to teach an outdoor recall in the same way that you teach an indoor recall. Start off with a “puppy” recall and then build from that. It may be possible to move through the stages a little quicker than you did indoors as your dog may pick up on the idea a little more quickly since it understands, but don’t assume this. Don’t forget that there are many more distractions available to your dog when doing outdoor training. Because of this you will have to use much higher level rewards. It also pays to mix the type of reward you provide. Rewards are anything your dog enjoys doing. Possibilities include effusive praise, food, clicker or playing with a toy. Challenge yourself to come up with at least five different rewards for your dog. Frequently, dogs are well behaved when in close proximity to you, but they know that there is a certain distance from which it is hard to control them. Just as you started a puppy recall on the lead, you may want to consider using a long line to train a recall at longer distances. There are many available on the market, but the best that I have found (for my hands and washability) is a neoprene one available from PermaTack. I have a bright orange one as it is easier to see in undergrowth. A sight variation on a recall is when you call your dog to come into the house. Some dogs much prefer to be outdoors and so can be reluctant to come indoors. I have been known to leave a dog sitting outside a door, waiting to come in for a short time. This way, the dog learns that I am in control of the door rather than it opening magically as soon as they appear on the other side of it. Put some work into your dog’s recall and soon you will be able to call it to you from anywhere in the garden. I haven’t personally tried Dog Rocks as I don’t have any grass. However a friend has tried them and found that they definitely helped for her grass. Her dogs had no health problems with them. So, from a very small sample of one, I would certainly say they were worth a try if you have problems with your grass.